We're rather fond of Irish trio Funeral Suits here at FG, with Jack giving them the Surfacing treatment recently. Unfortunately, their London gig this week (with fellow Surfacing alumni Pushing Hands) was cancelled amidst our fair capital's chaos. 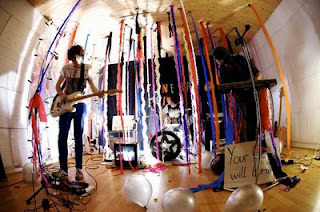 But we have good news in the form of a video to perhaps their best track, 'Florida'. Watch and listen below. Jack described their previous single 'Colour Fade' as "oddly enchanting and extremely hypnotic" and there's more of that off-kilter hypnotism on the surprisingly anthemic 'Florida'. A new single, 'Health', has also emerged online and is scheduled for release on September 26th. Both tracks will be featuring on the forthcoming debut album, produced by Stephen Street. For more info on Funeral Suits, head to Facebook.